​What is it about the holiday season that makes us want to use festive and seasonal dishes and serve ware for every single meal and drink? Much like Christmas music, these pieces feel like now-or-never things we have to put to use before we have to store them for another 11 months. We especially love holiday mugs—perhaps because they get filled with our favorite seasonal drinks like hot cocoa, Hot Toddys, apple cider and Hot Buttered Rum. Before you go looking up recipes and making your grocery list of ingredients for these festive drinks, check out these 15 festive holiday mugs you'll want to keep in rotation long after New Year's Eve. This cheerful mug from Fringe Studio is festive without being obnoxious. 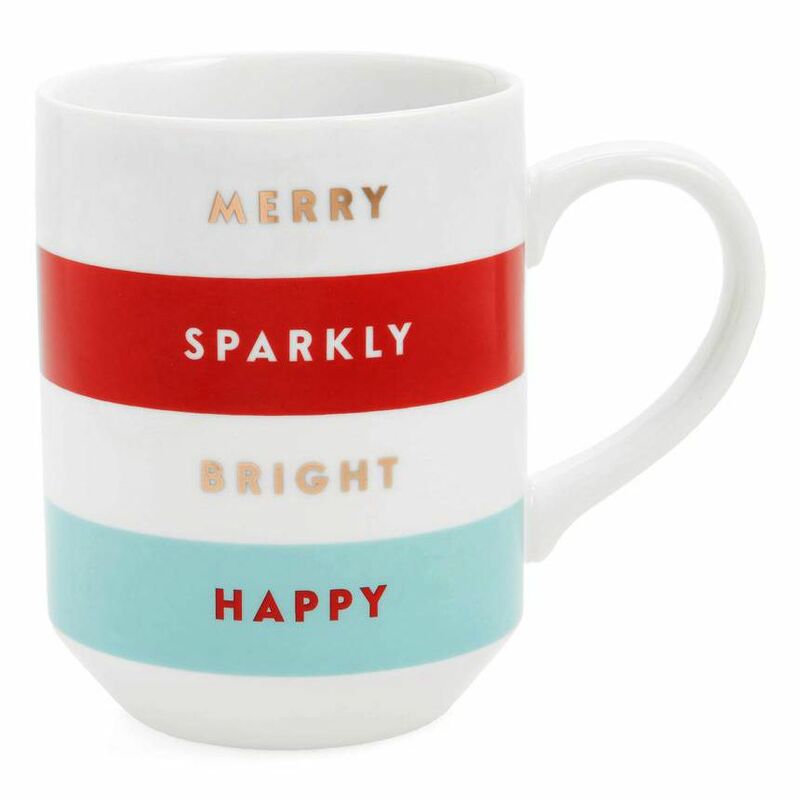 We love the colorful stripes and sweet message of the words: Merry, Sparkly, Bright, Happy. For all the National Lampoon fans out there—this mug is a holiday must-have. This glass mug with golden moose antlers would make the perfect (slightly oversized) stocking stuffer for the Clark Griswold in your family. Ah, Spode. These traditional and iconic Christmas tree mugs conjure up memories of holidays past, and a set of two would make a great gift for anyone looking to start their own holiday traditions and collection of classic Spode dishes. 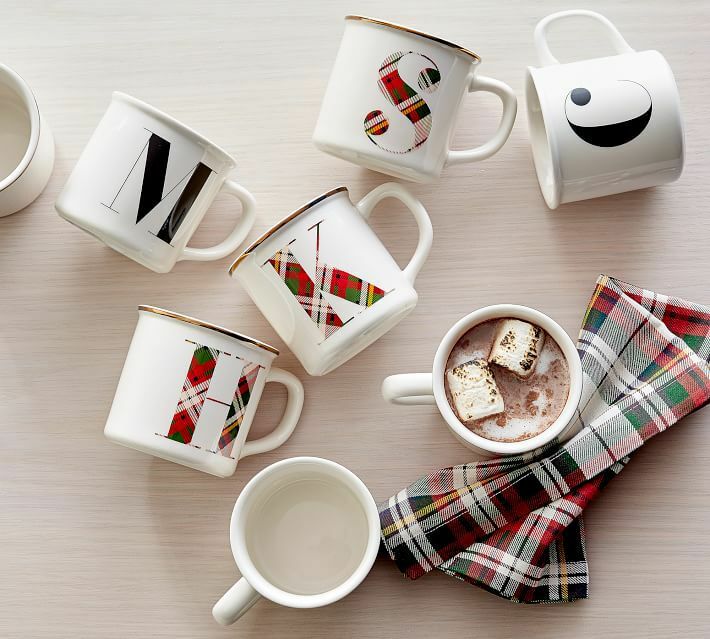 Leave it to Pottery Barn to dream up these sophisticated and festive mugs. Pick up a plaid letter for each member of your family for a matching Christmas morning breakfast moment. For anyone who loves a little bit of kitsch with their Christmas, this light up reindeer mug (thats wearing it's own sweater) is just the thing. Part nostalgic charm, part kitschy cool, the appeal of these Pottery Barn Santa mugs is how delightfully un-serious they are. These textured white mugs are actually designed to mimic the look of a cable knit sweater—making them the perfect companion to a cozy cup of hot cocoa. Etsy is a great source of playful and original holiday mugs—like this 'Oy to the World' Hanukkah mug we found. Take in the peaceful pastoral illustration of these Juliska County Estate mugs in a tasteful red-and-white design. This mug is more on the "splurge" end of things at $44, but would make an excellent gift. Clear glass mugs are our preferred vessel for hot cocktails like spiked cider or Hot Buttered Rum, but there's no rule about what they can be used for so go ahead and go nuts. Ah, the gold standard of holiday drink ware: The Hermès mug. This investment-worthy mug makes a truly special gift for anyone on the very, very nice list. What would the holidays be without a little cheeky humor? We absolutely la la love this llama mug from Pier 1 and we don't care who knows it! If you're looking to outfit your holiday table for guests or the whole family, Target should be your go-to source for holiday mug sets. We especially love this variety of six gold-and-white mugs that's just $40. Silly and seasonal, these naughty and nice mugs are great for couples, kids or anyone on your list who enjoys a bit of festive humor.